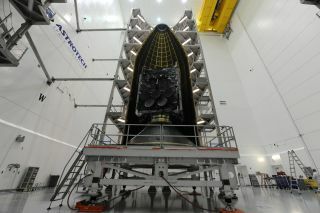 The Wideband Global SATCOM 9 communications satellite for the U.S. military is encapsulated in the payload fairing of a United Launch Alliance Delta IV rocket ahead of planned March 18, 2017 launch from Cape Canaveral Air Force Station in Florida. CAPE CANAVERAL, Fla.— A United Launch Alliance Delta IV rocket is poised to lift off this Saturday (March 18) to deliver a multipurpose communications satellite into orbit for the U.S. military. Blastoff from Cape Canaveral Air Force Station in Florida is scheduled for 7:44 p.m. EDT (2344 GMT), and will be the second launch this week from the Eastern Range. The launch window closes at 8:59 p.m. EDT (0059 GMT on March 19). Perched atop the rocket is the ninth member of the $442 million Boeing-built Wideband Global SATCOM (WGS) network, which collects and routes real-time data through thousands of terminals worldwide and supports the military's Global Broadcast Service. "It's essentially like having DishTV for us," Brig. Gen. Wayne Monteith, commander of the 45th Space Wing, based at Patrick Air Force Base, said in an interview. The WGS network is used to relay television broadcasts, video conferences, images and other high-bandwidth data to and from ships, aircraft, ground forces, operations centers, the U.S. Department of State, the White House and select partners worldwide. The network also provides services to U.S. allies, five of which paid for the cost to manufacture the spacecraft. A United Launch Alliance Delta IV rocket is poised to lift off Saturday (March 18) carrying a Boeing-built Wideband Global SATCOM (WGS) network satellite. A single WGS satellite has more capability than its entire legacy network, called the Defense Satellite Communications System (DSCS), a constellation of 14 satellites launched between 1982 and 2003. Four DSCS satellites remain in operation today. The WGS spacecraft support both X-band and Ka-band communications, which are parts of the electromagnetic spectrum used for data transmission. The satellites can seamlessly cross the bands to accommodate voice, data, video and other types of communications over a broad range of ground-based and mobile terminals. "WGS provides anytime, anywhere communications for soldiers, sailors, airmen, marines and international partnership through broadcast, multicast and point-to-point connections," said Robert Tarleton, director of the Military Satellite Communications Systems Directorate at Air Force Space Command in Los Angeles. WGS is the highest-capacity military communications system in the U.S. Department of Defense arsenal, Tarleton told reporters during a prelaunch conference call. In exchange for part-time use of the WGS network, Canada, Denmark, Luxembourg, the Netherlands and New Zealand picked up the $442 million bill to manufacture the satellite. "It's a win-win," Monteith said. "We get another satellite, and they get access to the entire constellation." The United States has a similar partnership with Australia, which paid for the WGS 6 spacecraft that was launched in 2013. The 10th and final member of the WGS constellation is targeted for launch in late 2018.